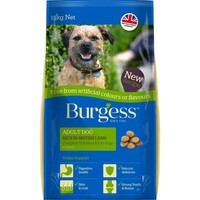 Burgess Free From Rich in British Lamb Adult Dog Food is a tasty and complete meal for adult dogs that has been made with only natural colours and flavours. Formulated with prebiotics to support digestive health and Omega 3 fish oils to support skin and coat health, the delicious recipe also contains natural antioxidants to support your dog’s immune system, and calcium to support bones and joints. Designed to be completely free from artificial colours and flavours, Burgess Free From food is the perfect natural alternative to typical coloured foods.